3.2.2014. 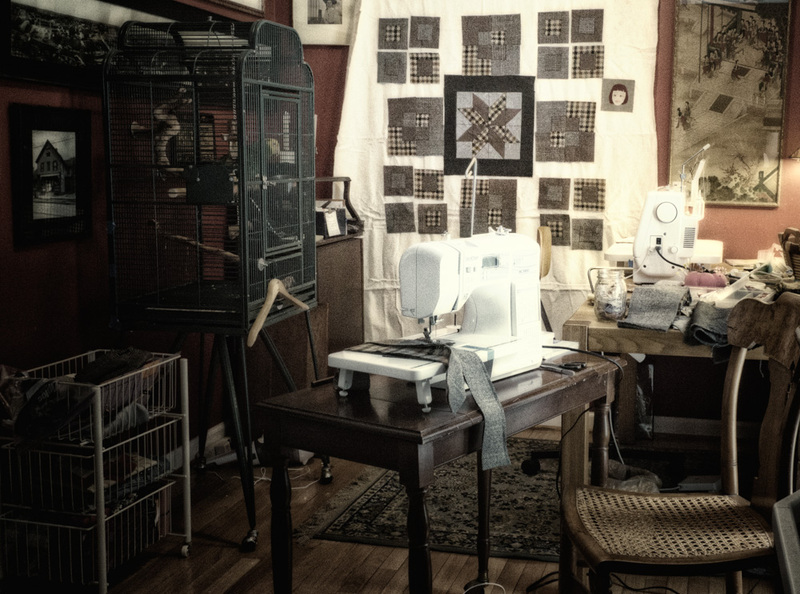 [Cont'd from 15 Feb 2014] The kitchen (above, taken 2/20) was overtaken by this quilt project. Two paintings were taken down so I could tack up the batting for a "design wall." The design wall was a necessity, since the simple plan we started with got lost as we realized that wool is harder to piece than cotton. The weave is looser. It tends to unravel. It piles up in thick, unwieldy seams (some that I wound up reinforcing with zigzag topstitching). Detours. (1) I had a thrift store wool remnant, lilac color. Could I make it pale gray? I threw it in the wash with bleach (unaware that bleach destroys wool). Nothing happened. No fading. No felting. Conclusion: my "wool" must be acrylic. (2) I decided to felt a really dull charcoal gray thrift store skirt ("100% Wool. Dry Clean Only.) 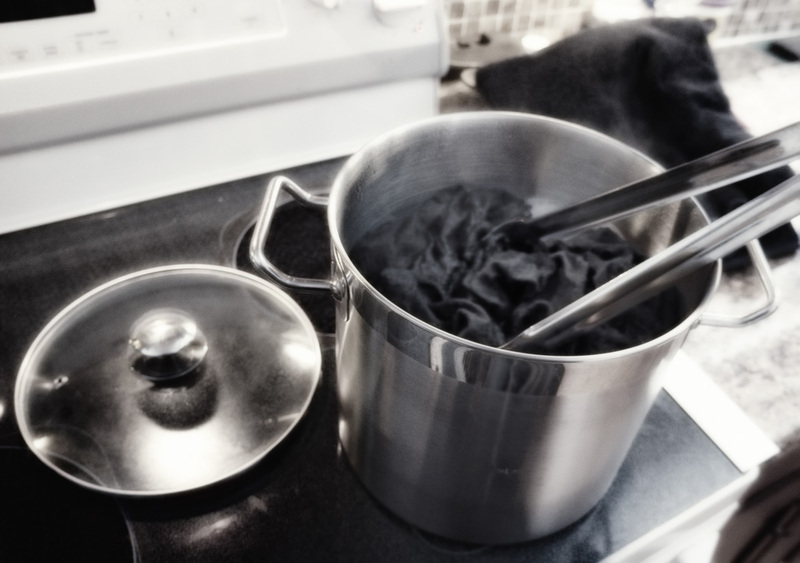 Nothing much happened in the washing machine, so I took to boiling it on the stove (photo below). It never really felted itself but maybe it got a little thicker. I moved on. 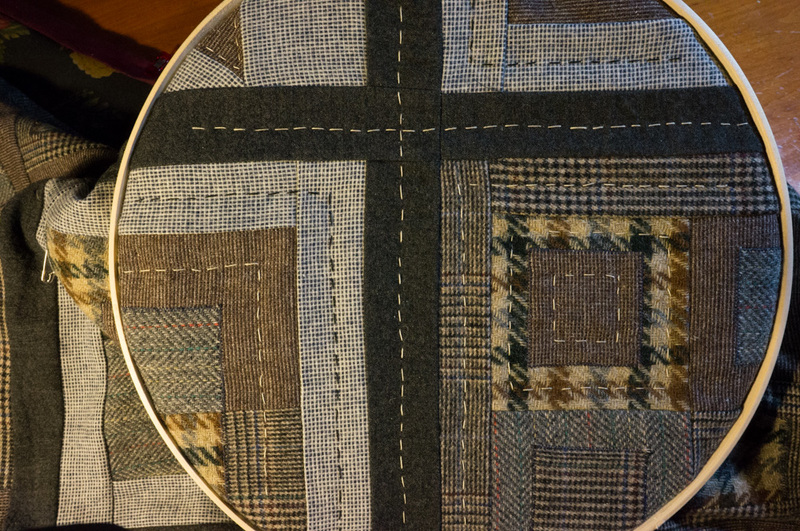 By Feb 24, the piecing was done. 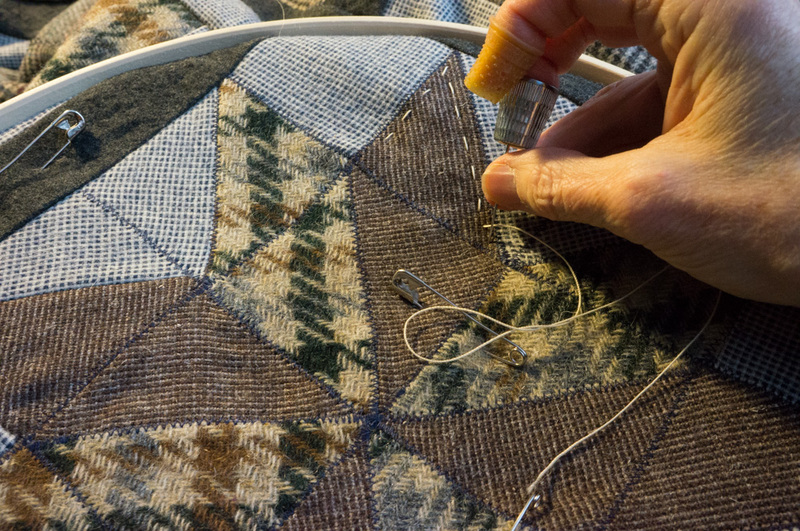 Jim did the sewing on the five major blocks and pieced narrow lengths of fabric together so we could cut strips of 2.5" squares. Then I took over in order to educate myself about piecing wool. Our final quilt top (above) has the following fabric: 3 remnants from the "used craft material" shop; from Goodwill, a woman's skirt, a woman's Pendleton suit, a man's sports coat; and from my own closet, a flowered Irish wool for the border. The backing is also pieced from remnants. In between is cotton batting. I basted the layers together with bent safety pins. 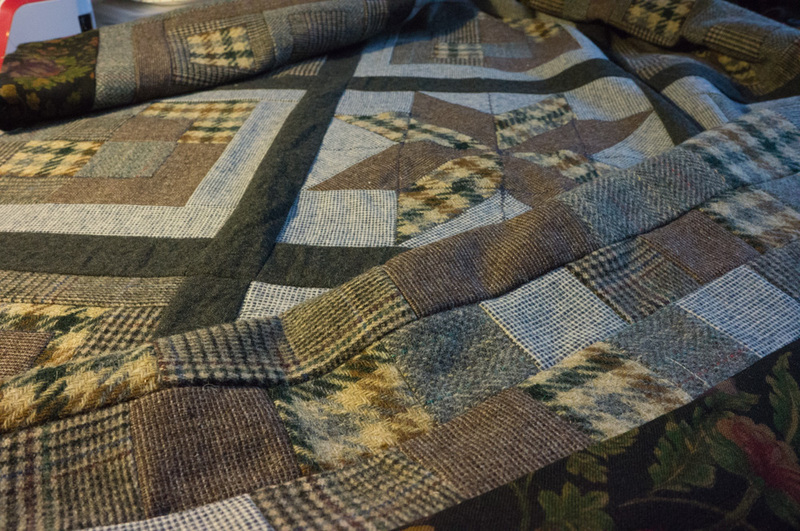 I briefly tried hand quilting with Quilt #2 and it seemed like a dismal amount of work with little to show for it. Then I discovered "big stitch" quilting. I had a ball of black perle cotton and picked up a ball of someone's ecru crochet cotton. With a big-eyed sharp chenille needle, a quilting hoop, a thimble, and a rubbery thing for my index finger, I was in business. Two videos were really helpful in getting me started: Hand Quilting With Perle Cotton by Sarah Fielke; and Big Stitch Lessons by Jo Glover, esp. Lesson 4 about the actual stitches. My results (below) are mildly uneven, which I find pleasing. I can do this in my easy chair while watching TV in the evening and it's moving right along. It's a nice break from hunching over the machine.